Tshehlwaneng Cluster Community Forum(TCCF) is a structure formed by communities from Makhuduthamaga Local Municipality Ward 12 & 13 to help each other with jobs, learnerships, information, workshop and others things to help alleviate poverty. TCCF had a meeting with the community to give them feedback on the issues the executive has been sorting. Letters has been send to Makhuduthamaga Local Municipality to help them regarding the high unemployment rate in the community and the poverty that is in the villages. The forum had talks with the Municipality to help them with the forum’s objectives. The forum asked people for donations and some donated. Makhuduthamaga Local Municipality referred the forum to Sekhukhune District Municipality and a request was send to Fetakgomo-Tubatse to set up a meeting. TCCF attended the meeting and Fetakgomo-Tubatse proposed a date which The District and the Makhuduthamaga Local Municipality Mayors, LED and the ward councilors will be available. 20th September was selected but postponed to the 25 September 2018. TCCF attended the meeting and the District send an apology and a LED representative. There was no apology from Makhuduthamaga Local Municipality and when the councilors were contacted they were not been informed about the meeting. 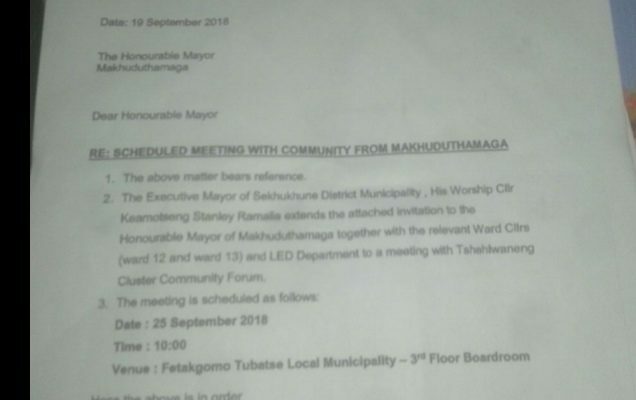 Another issue is that TCCF asked Makhuduthamaga Local Municipality for months to organize a meeting with Traditional leaders and the Municipality failed to do so. The Executive committee of TCCF had to go to traditional leaders on their own. Since that the Makhuduthamaga Local Municipality is dragging its feet to help the community TCCF decided to inform the community on how the forum is trying to help the community but the Makhuduthamaga Local Municipality is failing them. Members of community gathered and went to Makhuduthamaga Local Municipality. 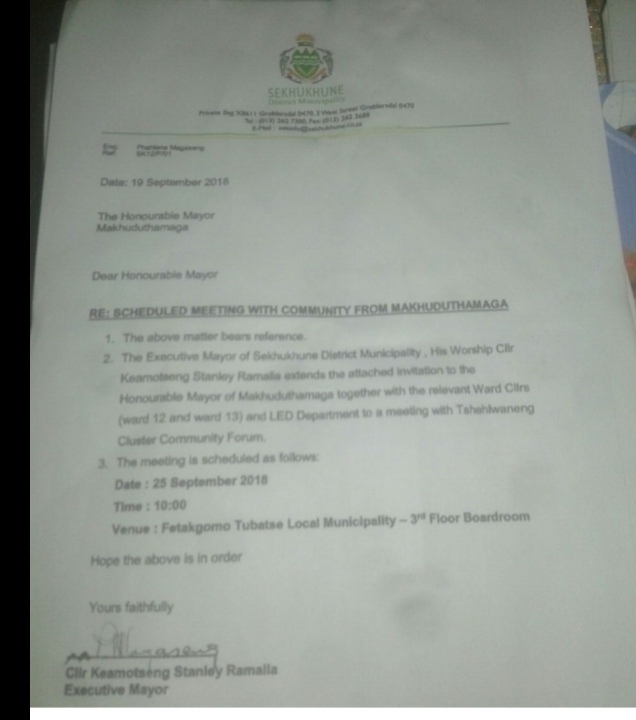 The Excecutive met with Makhuduthamaga Municipal Manager, the acting Mayor Mankge ( The Mayor was in Swaziland for other municipal issues)and others and concluded that the meeting will be on Monday 01 October 2018. TCCF learned that the Manager of the mayor’s office was even reminded by the district about TCCF meeting so he is the one failing the community.Community of this forum are labour sending areas and indirectly affected by the mines.